Over the past few days, I’ve been testing out some meals for The Lyons’ Share Spring Reset (It’s not too late to join us, but it will be soon! We have a great group going, and the motivational support is going to be fantastic!). Here are a few of them … you can see that there is plenty of food, plenty of variety, and a whole lot of green! The Reset isn’t a specific meal plan, and it isn’t overly restrictive … you can make it work for your lifestyle and activity level! A whole wheat wrap with red pepper hummus, stuffed with the contents of the two bottom bowls – lentils, black beans, and leftover roasted veggies, plus lettuce and avocado. Served with raw veggie sticks on the side. The fourth photo is what inspired today’s post. 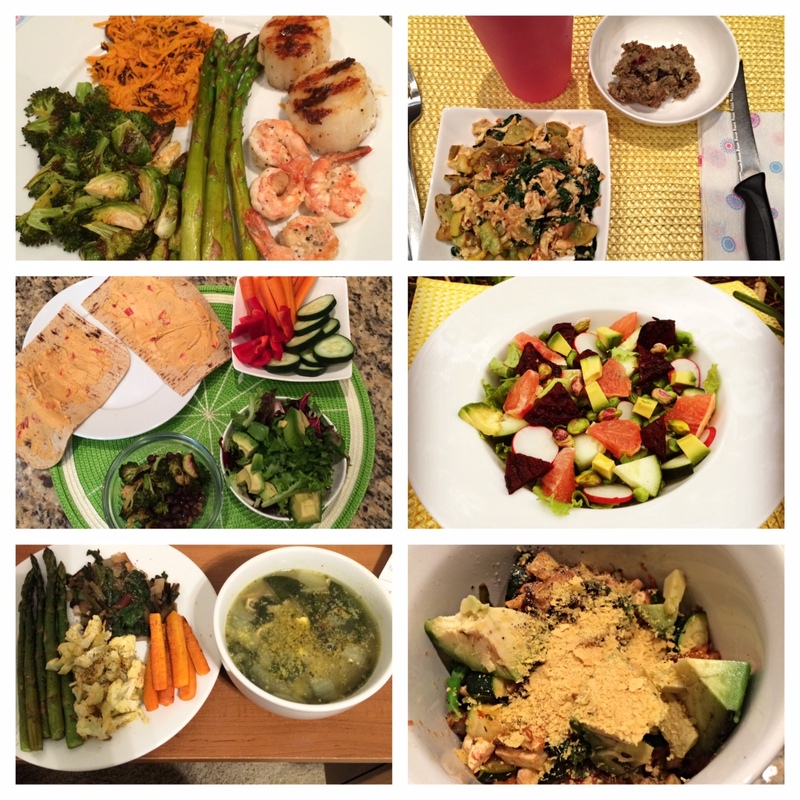 On Monday, I was looking for a light and nutritious recipe that would incorporate several varieties of seasonal produce (avocado, beets, grapefruit, and greens are all seasonal to April! ), and I threw this creation together in 10 minutes without a second thought. As soon as I took my first bite, I knew it would be perfect for today’s Foodie Friday, so I had to recreate it in order to share with you. It is fresh, tangy, and flavorful … and it’s one of those rare meals that you finish feeling perfectly satisfied but not overly full. 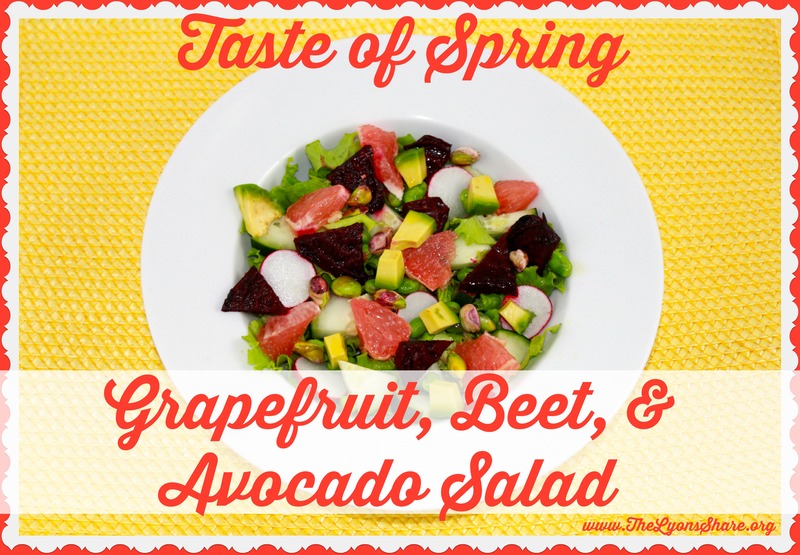 I hope you enjoy my “Taste of Spring: Grapefruit, Avocado, and Beet Salad”! So tell me in the comments … What is your favorite Spring food? The votes from my newsletter were a tie between asparagus, cauliflower, and mushrooms! What’s your all-time favorite salad topping? This all looks so great and wholesome Megan! Sounds like this Spring Reset is going to be awesome! Thanks, Sara! Hope you try the salad! I absolutely love this salad!!!! I’m excited for artichoke season but missing my parents bbq cause nothing is better than bbqed artichokes! So excited for you and your new endeavour. I know i’ve been MIA lately, but trust me I am keeping up to date and so freaking proud of you for going after your dreams! It is so inspiring! What?!? I’ve never tried barbecued artichokes, but that sounds awesome! Do you literally just grill them or put barbecue sauce on them? (“barbecue” means different things to different people – ha!). Thank you for the sweet comments. You don’t need to apologize for being MIA, but I’m glad you’re still following along! Of course, I’m loving seeing your great progression and impressive endeavors as well :). You go girl! Lora recently posted…Love your body! Lora, I think sliced almonds or pecans would be delicious! I have pistachios in there, but you can never have too many nuts in my opinion :). Grilled chicken would also be awesome! I was initially thinking about doing that but ended up just wanting a vegetarian option this time. Hope you enjoy! This looks delicious! I never would have thought of combining all of those ingredients. On our little island we don’t really have seasons, unless you count hurricane season, lol! We also don’t have the amazing selection of fruit and vegetables that folks in North America take for granted. I miss asparagus the most! Haha about hurricane season! Sorry you’re missing out on all the produce – although, there’s pretty interesting research to show that it’s much healthier to eat what is growing naturally in your area, so maybe you’re better off sticking to whatever is growing. I’d mail you some asparagus if it was feasible ;). Hey, there are many worse things than eating by color! I LOVE fruit in almost any form, so I’d certainly never turn down papaya, but it’s actually not one of my favorites! Grapefruit on the other hand … yumm!!! Michael Anderson recently posted…Five Reasons I Love April, My Quarterly Running Summary and More! YES for local sources and Farmer’s Markets! I haven’t been in a few weeks … thanks for the reminder! This salad looks delicious, Meg- as does all your food for the reset! I’m going to pretend it’s not Autumn here! Random, but I’m loving your macronutrient addition to the bottom, not for the calories or stats (lol), but because it’s further proof that you don’t need meat or eggs or typical protein sources in a salad to HAVE protein in there! Yes yes yes! I’m a big believer in adding in some sources of protein and/ or healthy fats to salads (because for me personally a bowl of veggies won’t keep me full for that long without some extras, even though I love my veggies! ), but you don’t always have to have meat or eggs! Whatever works for you! I absolutely love beets and avocado in my salads! Especially beets. Yum. Thanks for hosting, Kierston! I hope to pop around #RECIPEFRIDAY more often :). One of my faves, too, Jill! Looks like a great recipe! I’m not a huge beet fan myself but I probably need to give them another try as it has been a few years since I’ve had one. Try beets again, Jan! It’s funny that some people (I used to be in this camp!) just have a mental block against beets, but they really taste great! Looks like a delicious salad. I’m a huge fan of the Buzz Salad too (search YouTube for ‘buzz salad’), really anything that makes eating a handful of vegetables and colors easier! I love the Buzz Salad – looks like he just tosses in tons of fresh vegetables, which is basically one of my meal staples! I’m not sure I would want that hydrogen peroxide taste, though! Thanks for sharing!